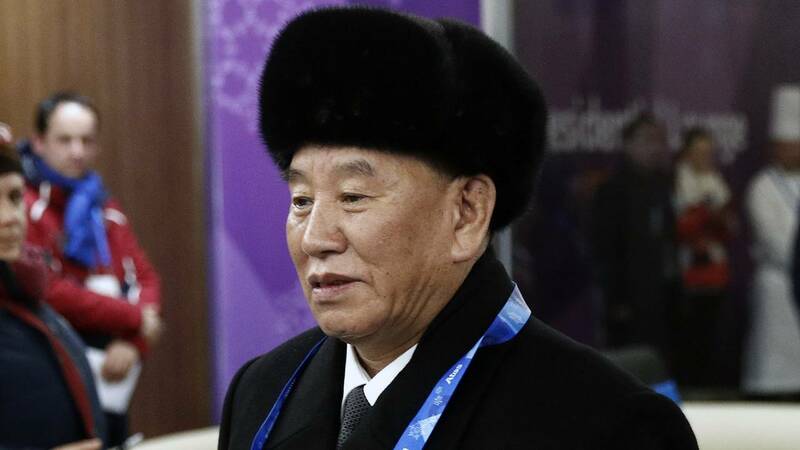 Kim Yong Chol arrives at the closing ceremony of the 2018 Winter Olympics at PyeongChang Olympic Stadium on Feb. 25, 2018. (CNN) - North Korea's lead negotiator in nuclear talks with the US, Kim Yong Chol, arrived in Washington Thursday, just hours after President Donald Trump rolled out a new missile defense strategy that appears to contradict his own claim that Pyongyang is no longer a nuclear threat. Lead negotiator Kim was spotted leaving the airport with US Special Representative to North Korea Steve Biegun and Pak Chol, a North Korean official who chairs the Korea Asia-Pacific Peace Committee. Amid signs the two sides are close to agreeing to a second summit the newly unveiled Missile Defense Review, which Trump personally introduced at the Pentagon, explicitly states that North Korea remains an "extraordinary threat" to the US, an assessment that is consistent with previous findings by US military and intelligence agencies but rarely acknowledged by Trump himself. Seven months ago, Trump declared that his first summit with Kim Jong Un in Singapore had eliminated any nuclear threat posed by the North Korea even though the meeting produced no verifiable proof that the rogue regime will discontinue its nuclear program. "Just landed - a long trip, but everybody can now feel much safer than the day I took office," Trump tweeted as he arrived back in Washington at the time. "There is no longer a Nuclear Threat from North Korea." Since that time Trump has insisted that talks with North Korea are yielding progress, pointing to the lack of missile and nuclear tests as evidence that Pyongyang is moving towards denuclearization. But Vice President Mike Pence said Wednesday that the US is still waiting on North Korea to take concrete steps to denuclearize, and the missile defense strategy released Thursday indicates that Pyongyang currently poses a significant threat to the US despite ongoing negotiations. "While a possible new avenue to peace now exists with North Korea, it continues to pose an extraordinary threat and the United States must remain vigilant," the Pentagon assessment says. "Over the past decade, it has invested considerable resources in its nuclear and ballistic missile programs, and undertaken extensive nuclear and missile testing in order to realize the capability to threaten the US homeland with missile attack. As a result, North Korea has neared the time when it could credibly do so," it says. Trump made little mention of North Korea in his public remarks at the Pentagon Thursday but the underlying missile defense strategy emphasizes efforts to improve protection measures against the existing North Korean arsenal. "The review reflects the fact that the Pentagon still views North Korea as a nuclear threat and states that the United States will enhance its missile defense capabilities to defeat a North Korean missile attack," according to Kingston Reif, director for disarmament and threat reduction policy at the Arms Control Association. "The review states that North Korea has yet to achieve the capability to credibly threaten the US homeland. North Korea has not conducted enough tests to establish confidence in a reliable, working missile. But we have to assume that North Korea has a nuclear-armed ICBM that could strike the United States," he said. "Even if the missile only have a 50% chance of hitting a major US city, that's enough to establish a modicum of deterrence," Reif added. "The review does look at the comprehensive environment that the United States faces and our allies and partners face and it does posture forces to be prepared for the capabilities that currently exist and that anticipate in the future," the official said. The Pentagon assessment has injected fresh skepticism into an already fragile diplomatic process as Kim Yong Chol, Pyongyang's former spymaster who has served as Secretary of State Mike Pompeo's counterpart in talks with the United States, arrived in the US capital. Kim is expected to meet Pompeo and US special representative to North Korea Steve Biegun on Friday, according to two US sources familiar with the negotiations.. It's unclear if he will visit the White House, but the sources say that is the expectation from the North Koreans and the US side is preparing for the possibility. But his trip to Washington is viewed by some as a sign that the sides are getting closer to reaching an agreement regarding a second Trump-Kim Jong Un summit. North Korea refrained from carrying out any nuclear or missile tests in 2018 and has taken symbolic steps toward denuclearization, such as shuttering a missile test facility and destroying parts of its nuclear test site, Punggye-ri. However, some argue that Thursday's Pentagon assessment indicates the US will need to do more than shore up its missile defense in addressing the threat posed by North Korea. "While there has been a yearlong pause in North Korean missile testing, Pyongyang's retention of its missile arsenal capable of striking at US forces in Asia and even threatening the US homeland indicates that its going to take more than just missile defense to change the equation with the Kim regime," said Behnam Taleblu of the Foundation for Defense of Democracies. "Missile defense has a role to play as part of a comprehensive effort to counter the North Korean threat but it's a limited one and its capabilities are often vastly overstated. We and our allies cannot missile defense our way out of vulnerability to North Korea's nuclear missiles," Reif said. "Pyongyang is clearly dissatisfied with what it has been hearing from Secretary Pompeo and other senior US officials and is eager to go over the heads of the President's aides in order to engage directly with President Trump," Evans Revere, a former US principal deputy assistant secretary of state for East Asian and Pacific affairs, wrote in a paper presented in Seoul on Wednesday. "The current impasse in denuclearization talks is the product of a US demand that North Korea take specific denuclearization steps, together with the DPRK's (Democratic People's Republic of Korea) insistence that the Singapore agreement is about improving relations and removing the US threat."